passion as fierce as the netherworld. One more Sunday (at least for a while ;-) we will listen to the exquisite Hebrew love poetry of the Song of Songs. As I went looking for some nice examples of cylinder seals to illustrate the first two lines of this poem, I came across this one from a recent exhibition in the Metropolitan Museum. On the left side is a small semiprecious cylinder stone (smaller than an inch) with a delicate ancient engraving and on the right side is its modern impression in fine clay. Ancient people wore these seals on strings around their necks or wrists. They used them in place of a signature. Archeologists found hundreds and thousands of these all over the Ancient Near East. There is one more interesting feature in this seal which makes it a marvelous illustration for our text from the Song of Songs. Some time after the seal was made, a cuneiform inscription was written on it. 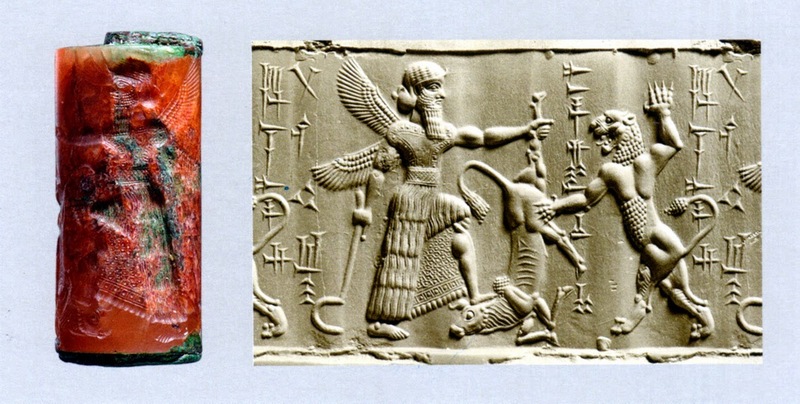 The text reads “Belonging to Mabu-nadin-shumi, son of Ashur, may god Nabu grant him life!” This seal clearly had double function - it was also an amulet. This Sunday we will rejoice in this apotropaic (evil-averting), protective, function of the seal of love.